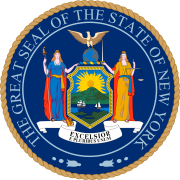 The 1854 New York state election was held on November 7, 1854, to elect the Governor, the Lieutenant Governor, a Canal Commissioner and an Inspector of State Prisons, as well as all members of the New York State Assembly. The National Democratic (in the press referred to as Hards) state convention met in July and informed the nominees by letter on July 12 of their nominations. Their letters of acceptance were published on September 11 in the New-York Daily Times. The Democratic (in the press referred to as Softs) state convention met on September 6 at Wieting Hall in Syracuse. Lorenzo B. Shepard was Temporary Chairman until the choice of William H. Ludlow as President. The convention appointed a Democratic State Central Committee which included John Cochrane and Horatio Ballard, and then adjourned. On September 7, the convention passed a resolution approving the Kansas–Nebraska Act, which led to the eventual withdrawal of delegates Preston King, Charles G. Myers, Abijah Mann, Philip Dorsheimer and few more Barnburners, all of whom would be the next year among the founders of the Republican Party. Governor Horatio Seymour was re-nominated "by acclamation" with a few contrary votes. William H. Ludlow was nominated for Lieutenant Governor on the first ballot (vote: Ludlow 234, Philip H. Crook 28, Oakley 14, Albert Lester 7, Isaiah Rynders 2, Preston King 2). Jason Clark was nominated for Canal Commissioner by acclamation. W. R. Andrews was nominated for Inspector of State Prisons on the first ballot (vote: Andrews 92, Amos Pilsbury 56, Henry Storms [incumbent] 27). 82 Whigs, 26 Softs, 16 Hards and 3 Temperance man were elected for the session of 1855 to the New York State Assembly. "Know Nothings are sprinkled miscellaneously among Whigs, Hards and Softs; and exactly how many there are of these gentry in the Assembly Nobody Knows." ^ "The Hard State Ticket". New-York Daily Times. September 11, 1854. p. 1. ^ "Soft Shells in Council". New-York Daily Times. September 8, 1854. pp. 1, 8. ^ "Free-Soil Democratic State Convention". New-York Daily Times. September 26, 1854. p. 1. ^ "The Anti-Nebraska Convention". New-York Daily Times. September 30, 1854. p. 2. ^ "Latest Intelligence: New-York State Temperance Convention". New-York Daily Times. September 28, 1854. p. 1. ^ "The Liberty Party State Convention". New-York Daily Times. September 29, 1854. p. 8. ^ "Anti-Rent State Convention". New-York Daily Times. October 27, 1854. p. 8. This page was last edited on 9 February 2019, at 17:12 (UTC).